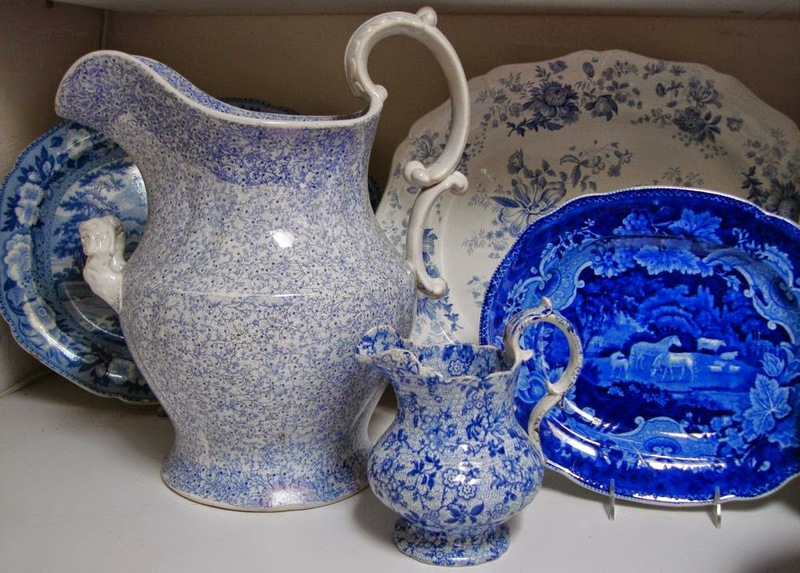 According to The Dictionary of Blue and White Printed Pottery 1780-1880, a sheet pattern is "A pattern which repeats the same motifs all over so that it can be used on any shape without engraving several different copper plates. These designs are sometimes referred to as all-over patterns. For reasons of simplicity and economy the technique was very commonly used for toy dinner services." I am going to add jugs and other items intended for adults. 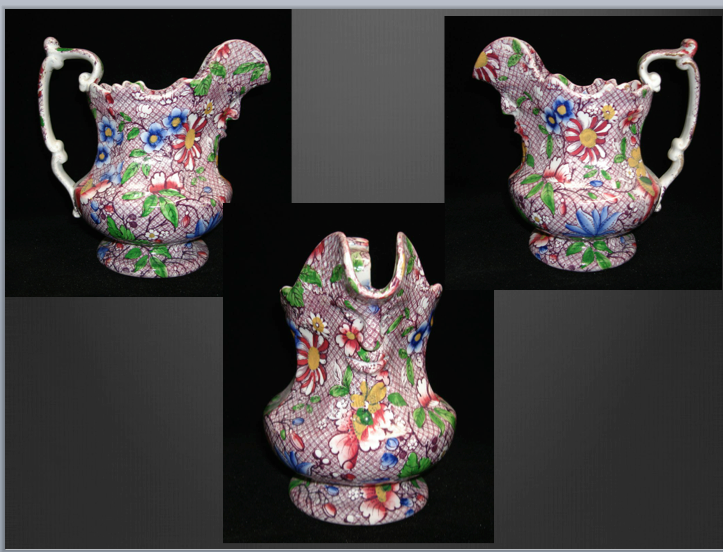 What you see above are three sides of a purple printed jug that illustrate how a sheet pattern can accommodate hollow items. There is no need for any careful placement of the pattern. The photo below shows how a sheet pattern, "Dragon," can accommodate items of different shapes and sizes. 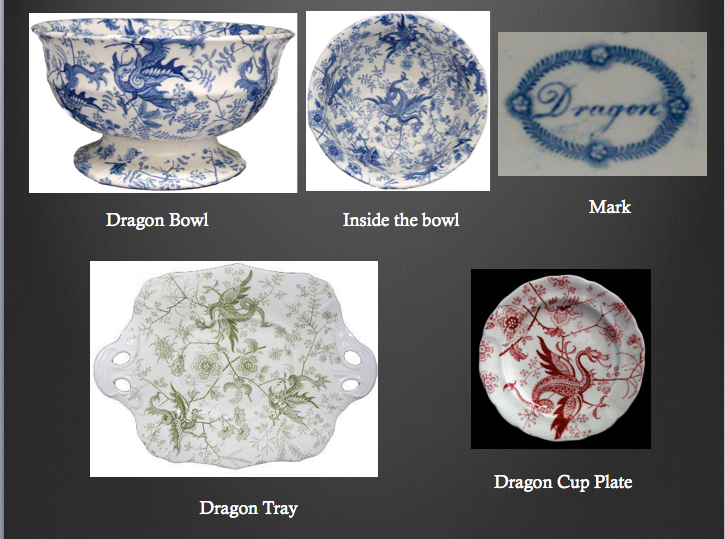 See how the same "Dragon" pattern was used on different sizes and shapes. The bowl is 10 inches in diameter, the tray is 11 inches wide and the cup plate is 3.5 inches (only room for one dragon). Because many of the patterns are floral, they are also referred to as chintz patterns. Some of the pattern names actually use the word "chintz." 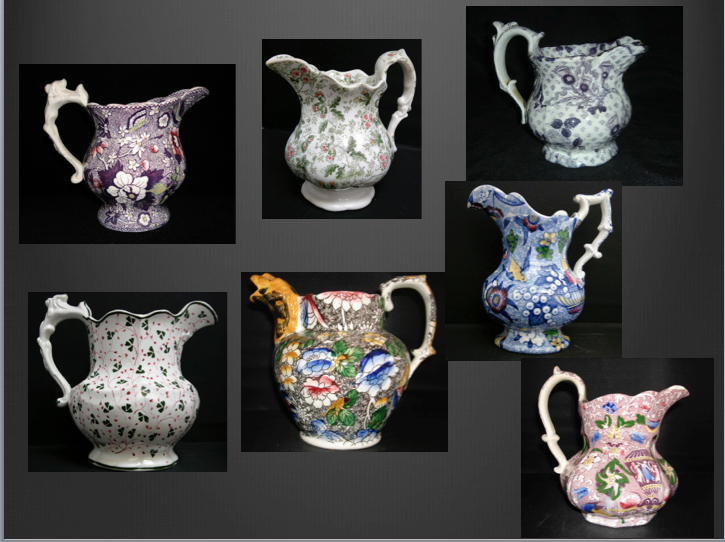 Here are a few more lovely sheet patterns on jugs. 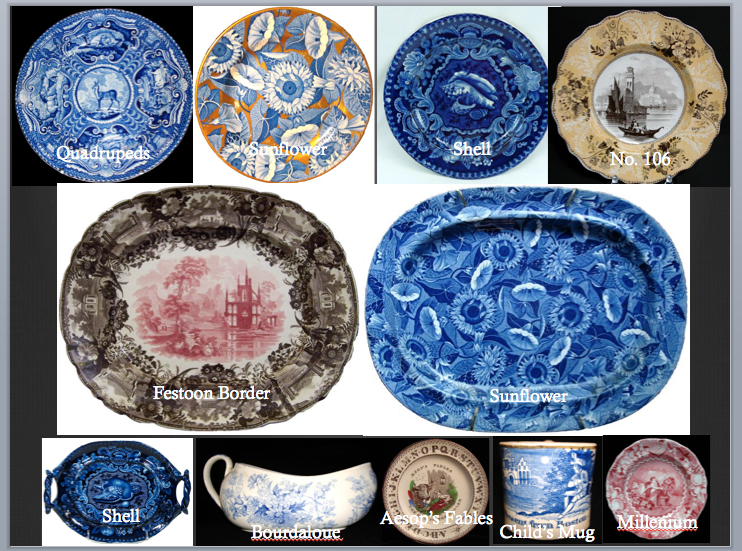 There is an excellent post about sheet patterns in Pam Woolliscroft's Spode History blog. Pam illustrates and lists many Spode sheet patterns, including Sunflower (also known as Convolvulus). 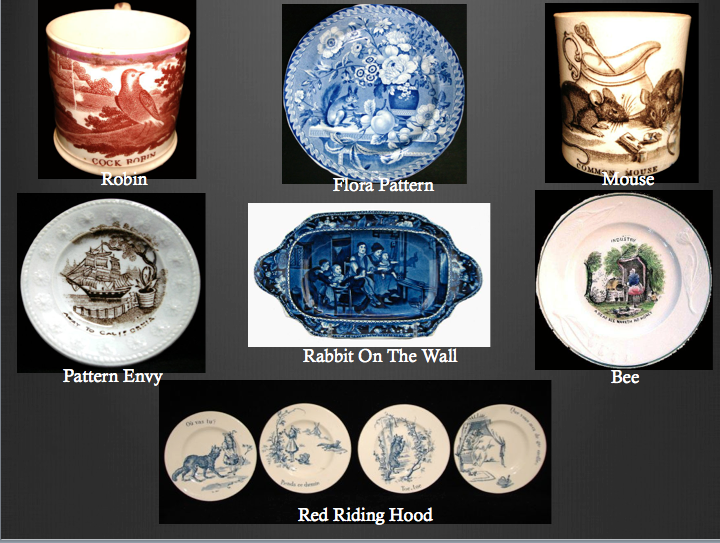 She says: "Some of the designs from Spode were known as sheet patterns. A sheet pattern is a design which is not engraved to specifically ‘fit’ different objects. 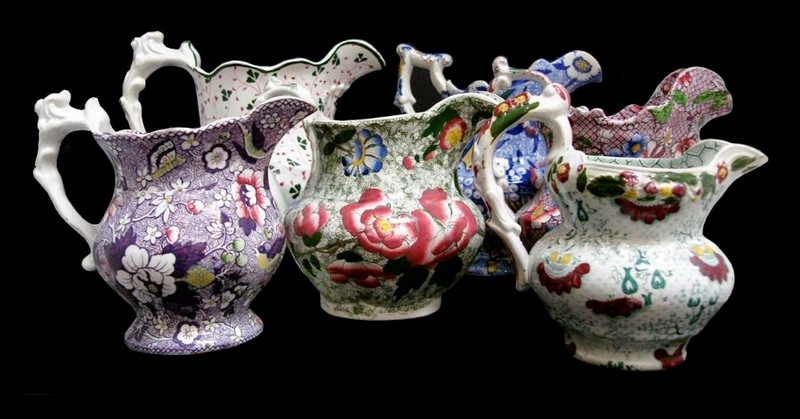 Perhaps only three or four engravings are needed for a whole range of tableware and toilet ware." 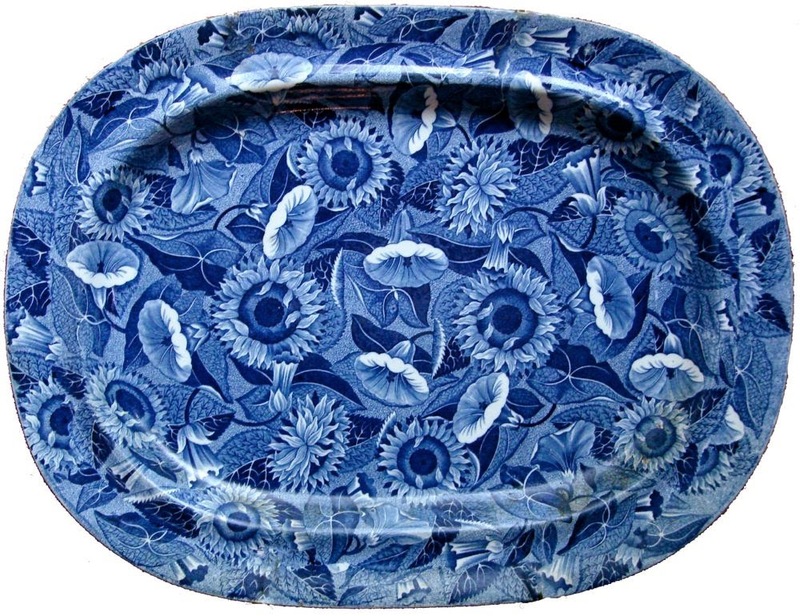 Spode "Sunflower" pattern (also known as Convolvulus) 18.75 inch platter/Notice that there is no need for an extra transfer for the border as the pattern covers the whole platter. Another sheet pattern is Grape. 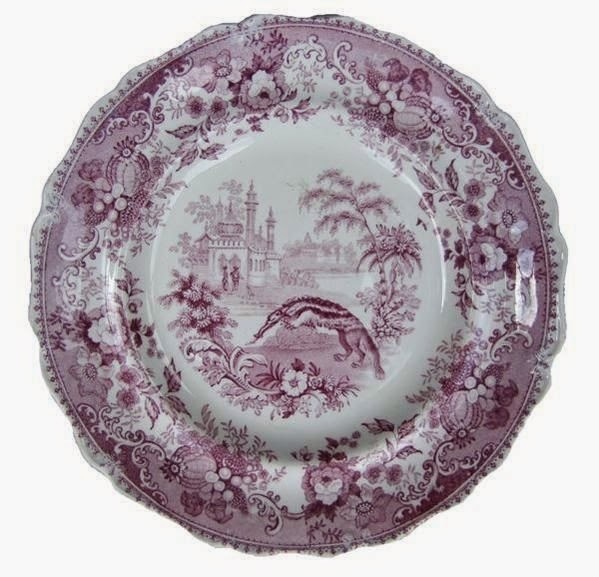 Spode made this pattern, but the one below is from an unknown factory. 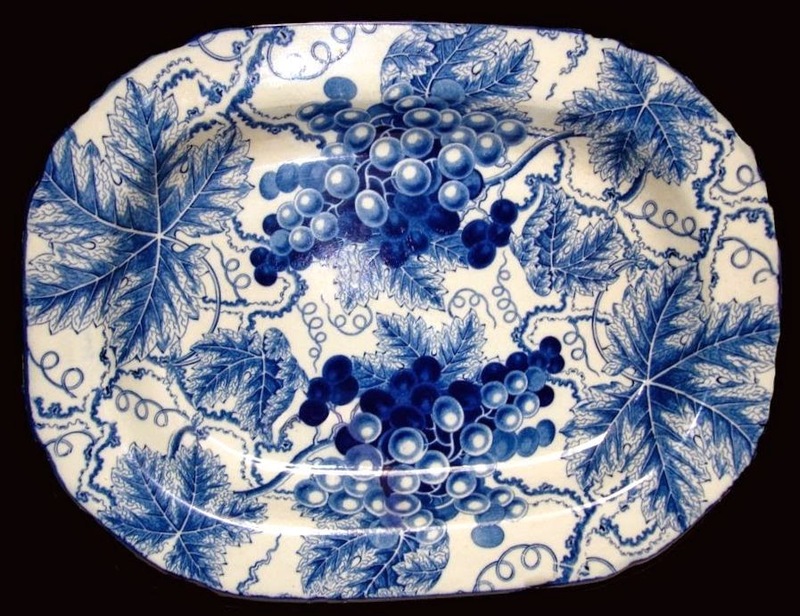 Or this stunning early Minton sheet pattern platter. 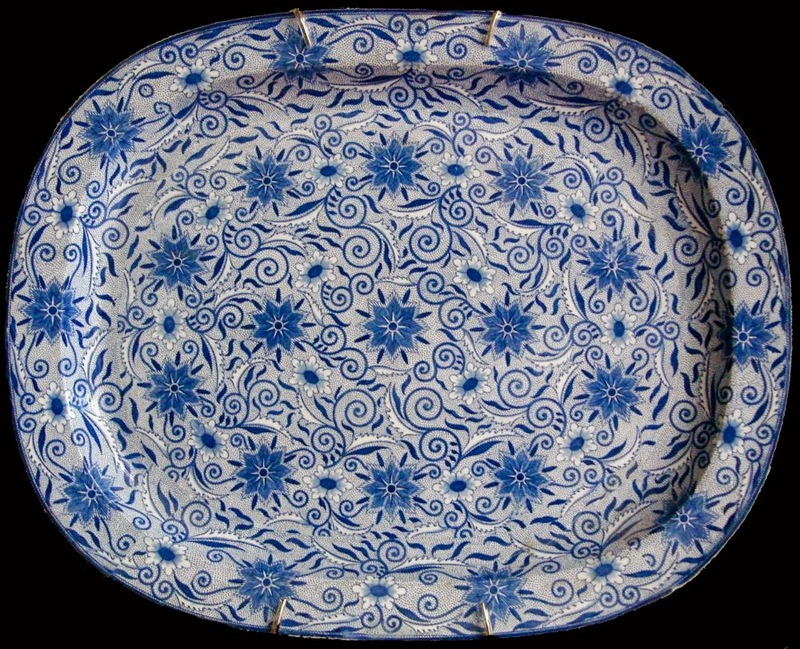 Minton sheet pattern 20.5 inches by 16 inches platter. The pattern is known as Star. Since sheet patterns were less expensive to make, they were often used on children's items. Doll plates, 3.25 inches. 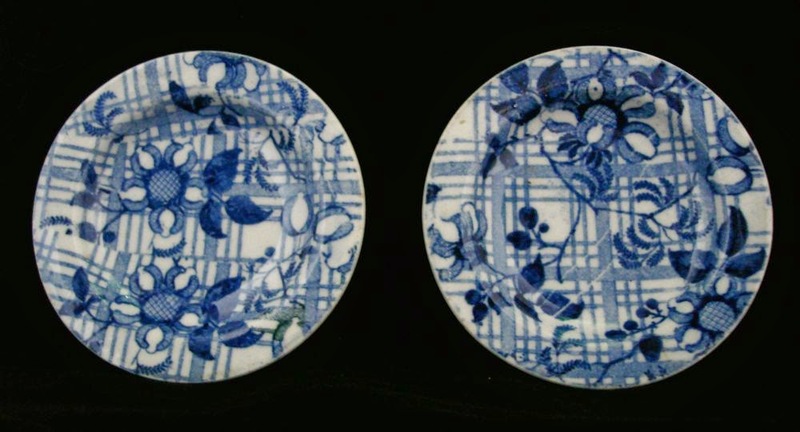 Notice how the pattern has the same elements, but placement is different on each plate. And for very large utilitarian items. The bath jug is 18 inches to the top of the handle and 33 inches in diameter at its largest point. The small jug is 8.25 inches to the top of the handle. The bath jug has an extra handle (known as a lug handle) because of its weight when filled with water. Items with sheet patterns may have been less expensive to make, but they lost nothing in beauty. 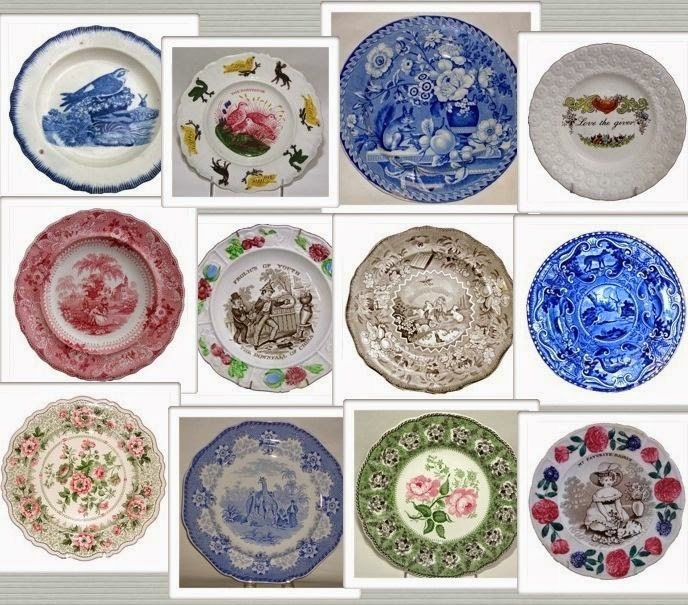 Transferware Patterns number in the many thousands. Here are a few of my favorites. I started my Dishy News blog on January 17, 2013. During the past two years, I have published 173 blog posts. 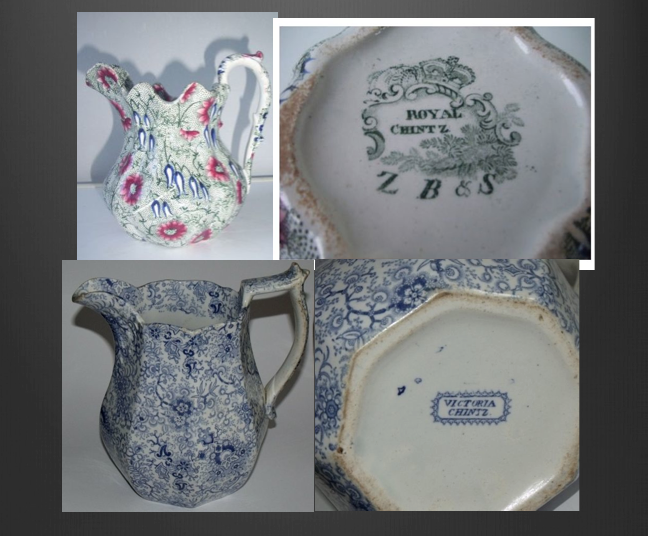 As I said last year, this is a personal blog about transferware patterns and shapes as well as my life. I was introduced to transferware by my mother and grandmother, so this is a lifelong love and learning experience. As my readership has grown, it has been interesting to see which posts are popular. Here are links to my readers' favorite posts. Some of the above posts are my favorites too, but here are some other personal favorites. I hope you continue to read and enjoy my blog! Thank you! "Wolverene" 2.25 inch child's mug. 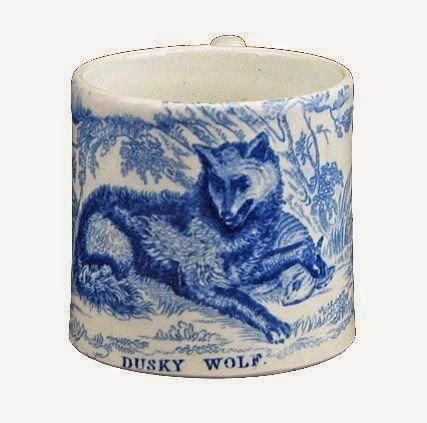 Many popular 19th century mugs and plates made for children are patterned with animals. Cats, dogs, cows, lions, etc. form the bulk of the patterns. However, some odd animals were chosen. 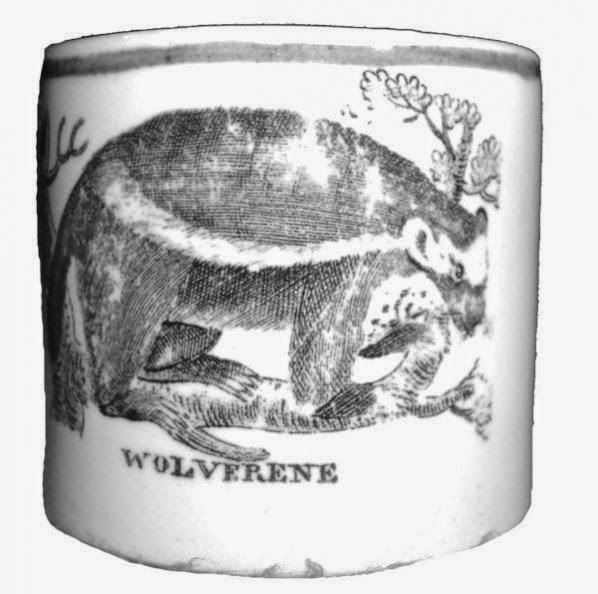 It is hard to believe that 19th century English children were familiar with wolverines. (The wolverene, today spelled wolverine, is an animal related to the weasel. It is known for its voracious appetite). The children probably wouldn't know a pintado either. "Pintado" 5.5 inch plate. 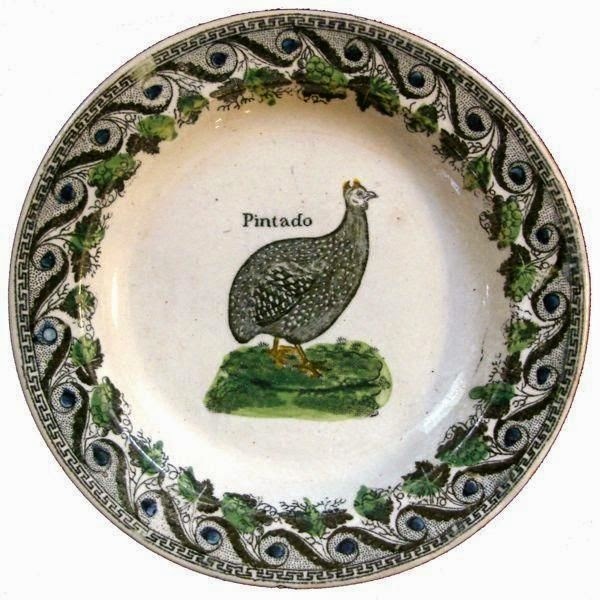 A pintado is also known as a guinea fowl. 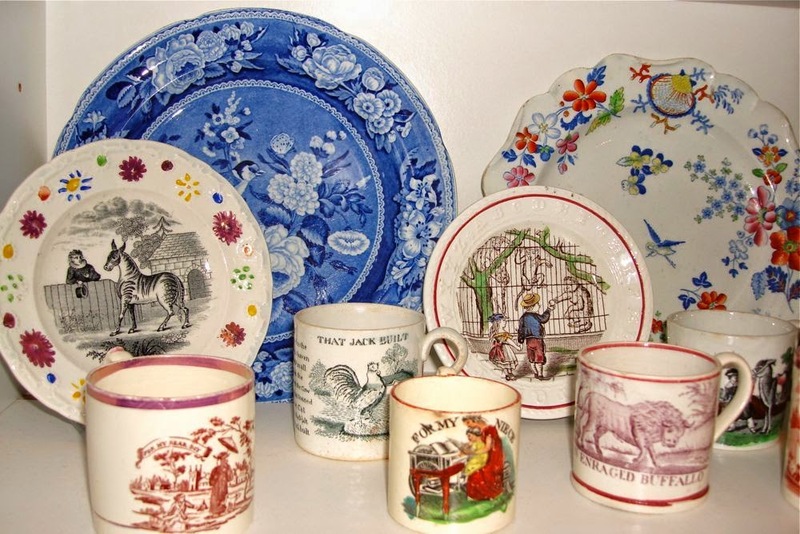 Children's china was intended as a gift as well as a teaching tool. Perhaps these unusual animals were a jumping off point to engage a child in a discussion about natural history. 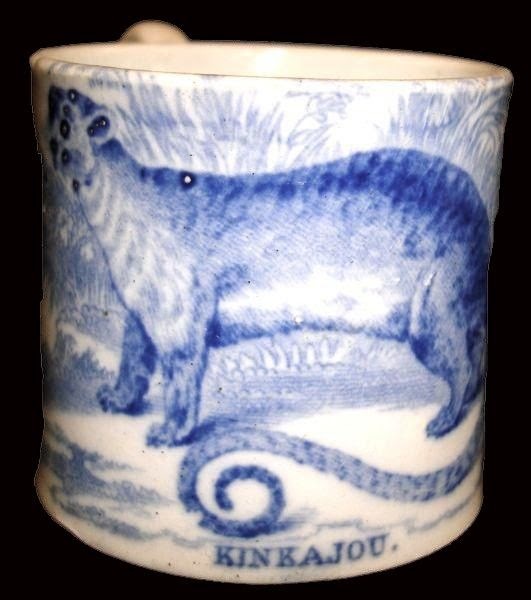 "Kinkajou" child's 1.94 inch mug. Kinkajous, also known as honey bears, are rainforest mammals related to raccoons. They resemble ferrets or monkeys, but are not related to them. I have known about kinkajous for about twenty-five years because my vet rescued two of them from an animal shelter. But, I never heard of them when I was a child. 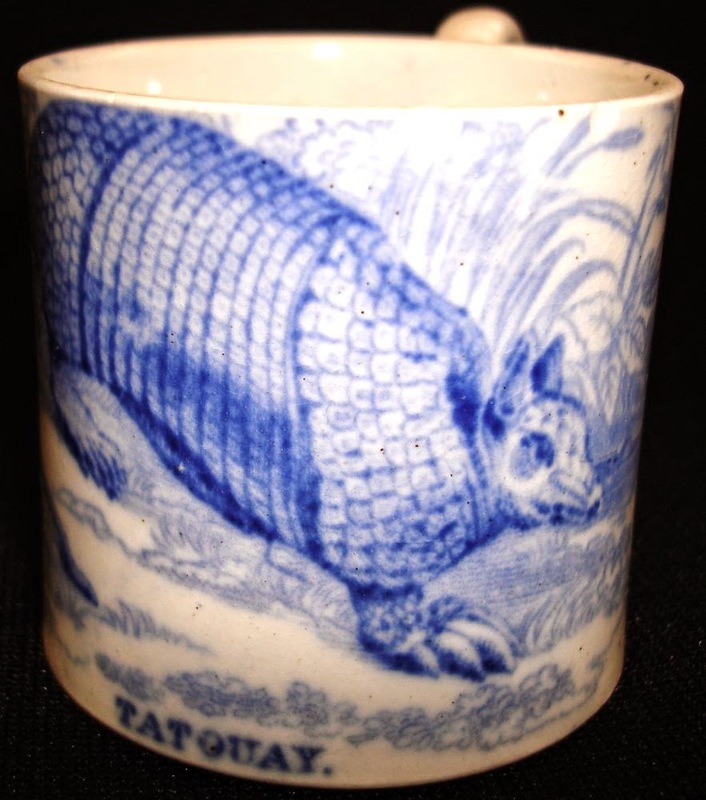 I guess the potter was desperate to have an unusual animal decorate his pottery. 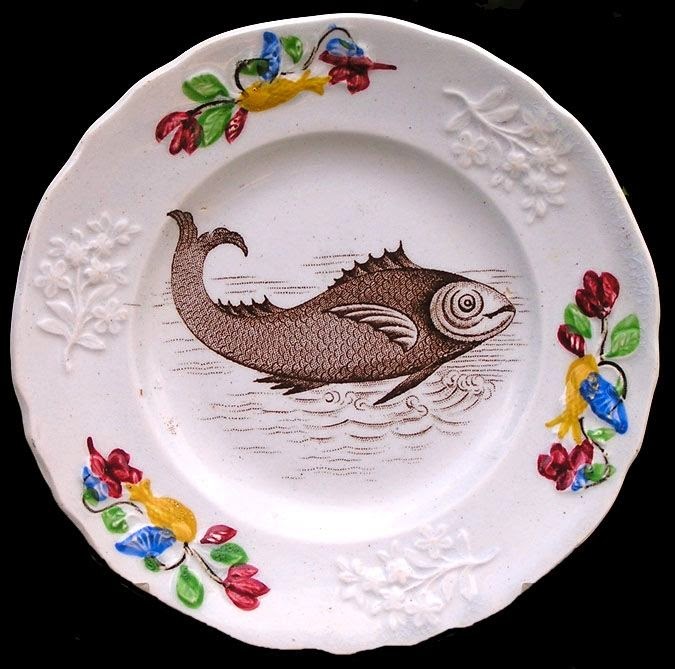 A fish is not an unusual animal, but the above child's plate decorated with a fish is the only fish pattern (on a child's plate) I have seen. I wonder what kind of fish it is. If you look closely at the molded border, it appears that a fish shape is among the flowers! An indris is a large short-tailed lemur of Madagascar. The pattern doesn't particularly look like a lemur. It looks more like a cartoon rat! Or the salivating wolf from a Disney-like cartoon. The greater naked-tailed armadillo, cabassous tatouay, is an armadillo species from South America. 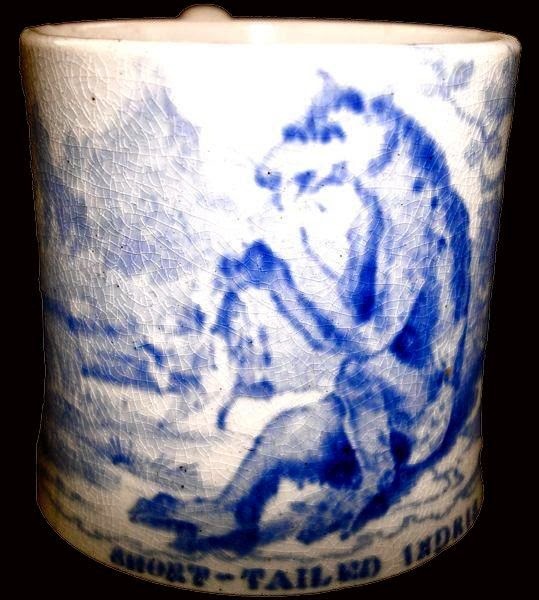 It is wondering what it is doing on an early 19th century English child's mug. The dusky wolf or black wolf is not unusual, but I want to show it to you anyway. This pattern really belongs in my post Inappropriate or Frightening Patterns For Children. If you look carefully, you'll see that the wolf has its paw on a dead goat! "Indian Scenery" 7.5 inch plate showing an anteater surrounded by an vaguely Indian scene. This pattern is from a dinner service that features different animals on nearly each size and shape. There are lots of patterns intended for adults that feature unusual animals like the anteater on the plate above, but that is a post for another day.